Our website address is: https://businessinaweekend.com. We respect the privacy of children and “child” means an individual under the age of 13. All information and content on this website is intended for individuals over the age of 18 that reside in the United States. Children under the age of 18 are prohibited from using this website. We do not knowingly collect, use or disclose personal information from children under the age of 13 without prior parental or guardian consent. If you believe personal information is collected from someone under the age of 13 without parental or guardian consent, then please contact us to have that information deleted. Your personal information is used to personalize your experience, improve the website to better serve you, provide customer service support, efficiently process your requests or transactions, tailor advertisements to you, elicit reviews of services or products, provide you offers, promotions and to follow up with you through correspondence (email, live chat, or phone). We may also use this information to provide you offers and promotions from our partners and/or our affiliates in exchange for a commission without additional cost to you. When you leave a comment on our website, you may opt-in to saving your name, email address and website in cookies. These are for your convenience so that you do not have to fill in your details again when you leave another comment. These cookies will last for one year. This information is only collected to better serve and understand your user experience on the website. You have the option of turning off cookies on your computer should you wish to do so. If you choose to do that, you may not be able to view all the features and content of this website. We have no control over these third parties and they have their own privacy policies. Neither are we responsible for the activities and practices of these third parties. You should contact them directly and read their privacy policies for any questions. You ask us to delete the information by sending a request to shauna@bountifulknowledge.com. Please note that such requests may result in you no longer being able to access paid or free content previously provided to you. If you have provided consent to the Company’s processing of your personal data, you have the right to withdraw that consent any time without affecting the lawfulness of processing based upon consent that occurred prior to your withdrawal of consent. Google will use this information on our behalf to evaluate the use of our online offer by users to compile reports on the activities within this online offer and to provide us with further services related to the use of this online offer and the internet usage. In this case, pseudonymous usage profiles of the users can be created from the processed data. We only use Google Analytics with activated IP anonymization. This means that the IP address of the users will be shortened by Google within member states of the European Union or in other contracting states of the Agreement on the European Economic Area. Only in exceptional cases will the full IP address be sent to a Google server in the USA and shortened there. The IP address submitted by the user’s browser will not be merged with other data provided by Google. Users can prevent the storage of cookies by setting their browser software accordingly; Users may also prevent the collection by Google of the data generated by the cookie and related to their use of the online offer as well as the processing of this data by Google by downloading and installing the browser plug-in available under the following link: https://tools.google.com/dlpage/gaoptout?hl=en. For more information about Google’s data usage, settings and opt-out options, please visit Google’s websites: https://www.google.com/intl/en/policies/privacy/partners (“Google’s use of your data when you use websites or apps of our partners”), https://policies.google.com/technologies/ads (“Advertising use of data”), https://adssettings.google.com/authenticated (“Managing information Google uses to show you ads”). Incidentally, the personal data will be anonymized or deleted after a lapse of 26 months. ENROLL NOW ~ it's FREE! 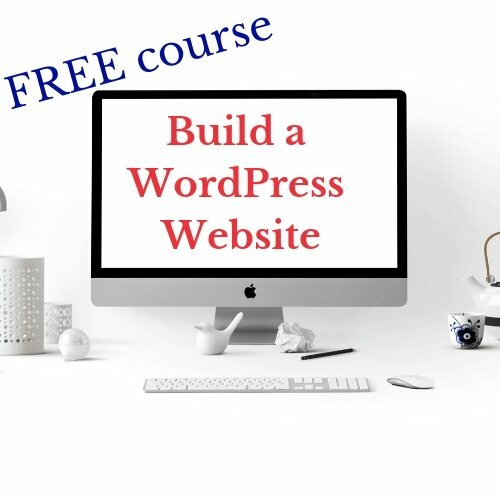 Get your invitation to the free Build a WordPress Website course. In the meantime, You will receive emails with tools to help plan your online business strategy and get you going right away! Welcome! Check your email for a message from me!